Search engine optimization is one way to increase your visibility and generate clicks and leads with search marketing. Truth be told, it’s the hard way. Long-term success requires producing stellar content your audience finds relevant and understanding how search engines work. Usually, it will also require great persistence. Pay-per-click, or PPC, is another option. Though you’re not likely to succeed with no knowledge, you don’t need a lot of expertise to get started. And no, patience is not required. You can enjoy results immediately. Though there are numerous search engines (and PPC programs beyond search engines), in this article we’ll focus on Google AdWords, which is by far the most prominent of all PPC programs. With pay-per-click, you get your web page displayed on the search engine results page (SERP) when someone searches for the keywords you’ve selected. As the name suggest, you pay only when your ads are clicked. Fees are based on a cost-per-click. 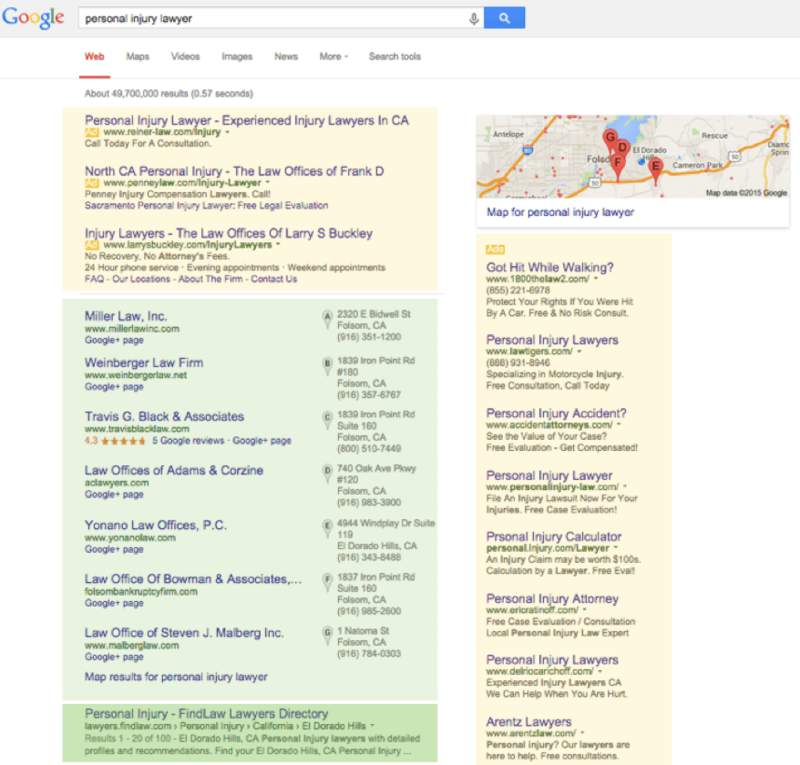 My search result for “personal injury lawyer” demonstrates how paid search can dominate screen real estate. The results screen in yellow are PPC ads. Light green represents firms with Google My Business listings and the darker green screen highlights the only traditional organic result. It’s no secret: far more searchers click on organic results than paid. However, PPC ads appeal to people that are shopping, hence they perform better for sales. A report by MarketLive claims paid search visits have a 35% higher conversion rate for e-commerce websites compared with visits from organic search. Visitors arriving from paid search links had a 2.6% average conversion rate in the first six months of 2013, compared with a 1.9% conversion rate for organic search visits. Paid search campaigns rely on three elements: keywords, ad creation, and landing pages. The effective PPC advertiser optimizes each of them. Keywords: You create a list of keywords that will invoke the display of your ads when people search for them. Ad creation: You create ads to be shown when the keywords are searched. The goal, of course, is to make them relevant and compelling so they earn the click. Landing pages: When viewers click on an ad they arrive at your landing page. The objective of your landing page is to earn a conversion, which can be a variety of actions such as purchasing, downloading, enrolling, etc. Your per-click cost is determined by (1) your bid and (2) quality score. Every time someone searches on Google, AdWords runs an auction to determine the ads that show on the search results page, and their rank on the page. Google explains that to place a bid in the auction, you first choose how you’d like to bid. Your bidding strategy can focus on getting clicks, impressions, or conversions. The majority of AdWords programs use the clicks strategy. Quality score is an algorithm that scores ads for relevancy to determine how closely the ad’s keyword relates to the content of its associated landing page. Yes, Google crawls your landing pages. Their job is to make sure users land on relevant pages. Quality score keeps advertisers in check and makes the game fair. Thanks to the quality scoring system, your ad may be displayed before others that bid higher because it is deemed more relevant. As such, quality score helps determine the cost-efficiency of your keywords, which in turn, helps optimize your choice of keywords. In a successful PPC campaign, you’ll create a strong relationship between your keywords, ad copy and landing page. AdWords offers three match types for keywords: exact match, phrase match, and broad match. If you want the deets, here’s how Google’s defines each. You might apply multiple strategies for setting match types. There is no correct or incorrect approach. Ultimately, your performance metrics will help guide your choices. When launching new campaigns, consider using broad match and phrase match to maximize clicks. After a while, pull reports to identify the keywords that converted best and set them to exact match. Your keyword choices and match types will change. You’ll experiment, examine and refine on an ongoing basis. For greater efficiency, Google AdWords accounts should be structured as campaigns containing ad groups. Use your ad groups and campaigns to stay organized. To manage your spend, you can set a daily budget at the campaign level. You’re free to assign specific budgets per campaign and change it when you like. You’ll be presented various options to allocate your dollars over time. For example, you can allow your budget to be used each day until it’s depleted or spread out throughout the day. Beginning advertisers are wise to start small, setting a low budget initially. You’ll quickly get insights regarding lead quality and can boost your budget if you’re pleased with the results. Remember, you pay per click, so it’s conceivable your daily budget won’t be spent every day. It’s only when your ads are working (that is, getting clicks) that you’ll see your charges reaching the levels you set. Let’s examine how to make your ads work. Given the PPC model, the goal is reach your maximum spend each day because you’re getting the clicks you want. Here’s where the writing of your ads comes into the picture. There’s not much to it. Literally. AdWords ads are concise. They’re also inflexible and uniform. You play by the following rules. Headline—Your headline (or title) can have up to 25 characters. It will be displayed in blue in a slightly larger font than the remaining lines. Display URL—A URL with a 37-character limit is displayed on the following line. Your display URL may be your home page, however, the actual page (destination URL) you direct readers to can (and should) differ. It can be any length. Description lines—Two description lines, limited to 35 characters each, follow. The second description line is commonly used as a call to action. The guidelines above apply to the typical format of a paid search ad, which appear in a sidebar on the SERP. For popular categories, ads often appear atop the page (and even the bottom) and in this case, they are organized slightly different. Use your keywords—Include your keywords at least once. Consider placing keywords in the headline and descriptions. They will appear bolded when they match the search inquiry. Be clear—AdWords doesn’t accommodate creative writing. Get right to the point. Call for action—Write a short, focused, actionable call to action featuring verbs such as: get, save, shop. Suggest urgency, when appropriate with phrases such as: limited time, today, now. Differentiate—Read your competitors’ ads in an effort to identify a unique selling proposition for yours. WIIFM—Answer “what’s in it for me?” by addressing pain points and desires. Be specific—Be as specific as possible about your solution. Note that specific does not mean sensational. Watch the superlatives. Stay credible. Match your headlines—Meaning, match your ad headline to your landing page headline. This generally increases conversions because it keeps your ad and landing page copy consistent (but as always – TEST!). Get it right—Let no mistakes slip by. Check your spelling and grammar. Abide by the rules—AdWords enforces rules prohibiting symbols and capitalization. Learn them here. Review your work—Always preview your ads before submitting them. Look to remove redundancies and format the ad as elegantly as possible. Google allows you to include ad extensions, which feature additional links. They’ll appear in blue type, below your description lines. Take advantage of ad extensions by including information on offers, locations, additional landing pages and even phone numbers. Extensions will increase the real estate you get and deliver additional information the reader may find helpful. There’s no charge for extensions, so try them. The granddad of today’s modern data-driven marketing has to be pay-per-click. PPC is inherently rich in metrics. That said, this section could expand into a book. Let’s aim for the cliff notes here by examining the most essential metrics. Impression—An instance of your ad being served as a result of a search. Click—A viewer clicks on your ad. Conversion—The viewer clicked and then took action on your landing page. Tracking code is used to measure conversion. Spend—The amount of money spent to date, per account. 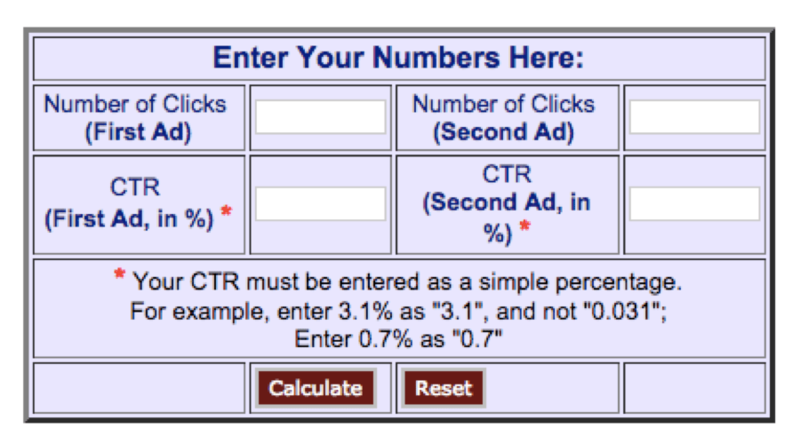 Click through rate (CTR)—The percentage of impressions that result in clicks. Conversion rate—The percentage of clicks resulting in conversions. Cost per click (CPC)—The amount spent on each click. Cost per acquisition (CPA)— The amount spent on each conversion. Your goal is to perpetually increase efficiency as measured by the cost metrics. As you optimize your keywords, ads, and account structure, you’ll measure campaign performance and work toward reaching your goals. AdWords offers a built-in split testing feature, to help you optimize PPC ads based on actual performance. This means you’ll have an A and B version that differ. They’ll be served 50/50, giving you results to indicate a winner based on click-through rate and/or a cost-per-click. In a video published by QuickSprout, Brian Dean of Backlinko explains the process. He recommends testing your title, the first line, the second line, and the display URL. Brian suggests you don’t change your landing page when split testing ads. One approach is to create completely different headlines, description lines and URLs. Another more pointed approach is to split-test ads against one another by changing a single variable. Your headline is an obvious candidate. You need a significant enough sample to validate your results. Splittester.com is a useful free tool for assessing the results of your A/B tests. I told you it’s not difficult to get started with PPC, but also warned it can get tricky and technical. If you’re battling for highly competitive keywords and aiming to perpetually improve ROI, you’ll benefit from enlisting the help of PPC pros. Also, the Google AdWords program changes often, so though you know more now than you did ten minutes ago, it’s always a challenge to keep up. I recently conducted a panel discussion with PPC experts to discuss common PPC questions and mistakes. You can check out that post here if you’d like to get insights from three experts who optimize PPC from the trenches each day.